Replace missing teeth, eat what you like and smile with confidence. Invest in dental implants from £23 per month at Brite Dental. The crown – a replacement tooth that you can see above the gum, custom made to match your natural teeth. Firstly, our dedicated care team will take the time to put together the best treatment plan for you. Implants can be an option for replacing a single missing tooth, for stabilising dentures, or for making the transition from failing teeth to an implant supported bridge. Prior to the procedure, a local anaesthetic will be administered to numb the area where the implant will be placed. When you are comfortable our dentist will make a small incision into your gum tissue to reveal the bone. They will then create space using special instruments and will gently insert the titanium implant. The bone around the dental implant will grow and integrate with the implant. Careful hygiene procedures are maintained during this period and patients are advised not to apply pressure in the treated region. During this stage of the process, your dentist may place a temporary restoration on your implant because of aesthetic and functional advantages. Once the healing period passes, the implant abutment is placed so that it can connect the dental implant to the crown. Our highly skilled lab technicians will then fabricate the final restoration for your implant. Finally, the dental crown is moulded to suit your colour, size and fit and is then bonded to the abutment. 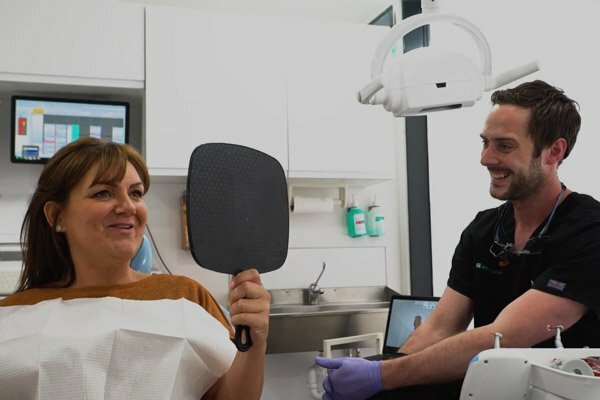 Contact us today to book your dental implant consultation and get that step closer to achieving the smile you have always dreamed of.